Australian error coins are a fairly popular collecting theme among a lot of collectors. Among the most unusual of Australian error coins is the brockage. A brockage is what results when a pressed coin fails to exit the press when the next blank planchet enters the press to be struck. The coin that fails to exit the press is usually stuck to the hammer die (typically the reverse), and is known as a “cap” because of the form it assumed (like a bottle cap). So, when the new blank planchet is struck the obverse side is struck with the normal obverse die, BUT the reverse side is struck against the “cap” (the coin that did not exit from the press correctly). So, you end up with a correctly struck coin obverse and an incuse mirrored image of the obverse on the reverse side of the coin. This is known as a brockage. Often, the cap coin remains on the die for many strikings and the ‘cap’ shape of the coin becomes more and more pronounced and the obverse of the coin becomes progressively more and more worn and smeared as more and more brockages are struck. You can see a nice image of a Die Cap here. As the cap coin becomes more worn the incuse image on the struck brockage become less and less clear and well struck. 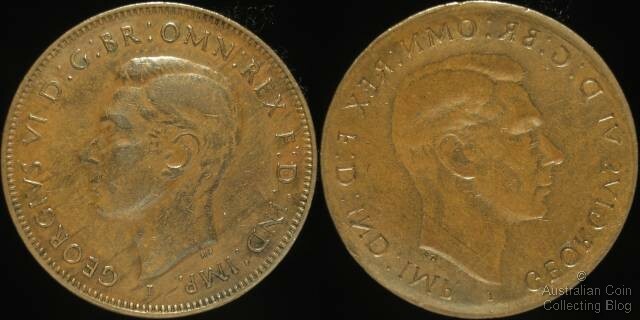 Brockages of Australian Coins are very rare and seldom seen. For those of you who are interested in obtaining one then it is best done at Auction. You can expect to pay a premium for Australian Pre Decimal coin Brockage errors.